Another Schornstein quote that I like: “Before a Winterreise performance, I saw an exhibition of her twenty-four watercolors for the cycle at the Pasadena Art Institute. Another aspect of her creativity – ‘There was no art form that was safe from me. 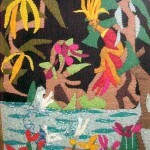 '” Check out some of Lehmann’s art work. You can find Dr. Schornstein’s complete article “Fan to Friend” at the bottom of this page. I have some fun Lehmann stories: In the mid-1950s a London taxi driver named Alf Levy saw Lehmann standing in front of a hotel and almost fell to his knees. “Madame Lehmann!” he said. “You recognize me?” said the singer, who hadn’t appeared in London since 1938. “Madame Lehmann,” the cabby continued, “give me Die Walküre, I can hear every note of your Sieglinde. Give me Der Rosenkavalier, the Marschallin is you.” That same kind of adoration that didn’t seem to fade was enjoyed by Lehmann as she headed toward Vienna for the reopening of the opera house there in 1955. Before Vienna she stayed in a small inn and was barely in her room when the innkeeper appeared trembling with excitement and bearing flowers. 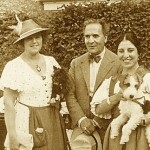 In matters private: as far as anyone knows, Lehmann was never sexually involved with the German conductor Bruno Walter (his mistress was soprano Dusolina Giannini [1902 – 1986]), though Lehmann respected him as a mentor, conductor and pianist (he accompanied Lehmann in recitals in Europe and the US, though he was not her regular pianist). 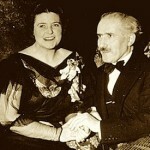 Lehmann was intimate with Walter’s contemporary, Italian conductor, Arturo Toscanini. Late in both of their lives, the musical and the romantic (even sexual) mixed together; we have Toscanini’s love letters to prove it! Speaking of letters, Lehmann wrote many. Her typed and self-corrected letters became famous. As spontaneous as she was on stage! I’ll try to collect some letters and as for you to send copies or transcripts of what you have. Here’s a beginning page of Lehmann Letters. Other speculations on Lehmann’s personal life involve her relations with women. There is no evidence that she was sexually active with women. She did live with Frances Holden from 1938 (the year of the death of her husband Otto Krause) until her own death in 1976. And certainly Frances was a lesbian. It is our own limitations that can’t imagine them living together platonically. I was with the both of them many times; there was the intimacy of a lifetime of companionship, but I witnessed nothing more. Lehmann seemed to enjoy the company of gay men in her 70s and 80s. Many of her best friends (and students) were gay males. Did you know that the 1975 movie called The Day of the Locust uses Lehmann’s recording of Feldeinsamkeit, a Lied by Brahms? And at the end of Christopher Nupen’s video Schubert bio you’ll hear Lehmann sing his Abendrot. Or did you know she appeared in the 1932 German film Wäsche-Waschen-Wohlergehen? I’m often asked why she was always known, especially at the Music Academy of the West, as “Madame” Lehmann. It may have been a mark of respect especially for European divas. If someone knows more exactly, please let me know! Let me quote a fan’s memory of Lehmann’s last Met appearance: “Closing Night of the Old Met, April 16, 1966 with a sentimental gala farewell performance featuring nearly all of the company’s current leading artists. If I may further quote from Beaumont Glass’s Lehmann biography, Lotte Lehmann, A Life in Opera and Song, on the occasion of the last night of the Metropolitan Opera at its old house, “When Lotte Lehmann, proudly erect beneath her years, came forward, everybody stood up.” By the way, the same thing happened when Lehmann returned to Vienna for the reopening of the opera house there. She entered, a bit late, I’ve heard, her timing was immaculate, and the whole audience rose as one. 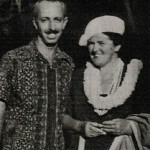 Without Frances Holden, Lehmann’s career would have ended when her husband died. We are in her debt for those extra twelve years. Her doctorate was in psychology…her field of interest was the study of genius…which they both were. I quote only that of which I feel certain, and the words taken from letters are in quotes. No attempt has been made to reproduce Lehmann’s accent. For those who have heard her speak, the grammar in her letters will not seem at all awkward. Here are two letters, beyond which you may not need to read. Please excuse the delay in answering your letter. There is one talent in which no one, no one, can equal me. Letter writing. I mentally write letter after letter to all my friends but as these astonishing outputs never see paper even my dearest friends don’t know how much I think of them. Thank you for your invitation to dinner. Unfortunately I have a horror of restaurants. I prefer eating lousy food at home to the most mouth watering products of restaurants…. I should write a good [biography of Lehmann]…. Instead I have spent many, many sleepless nights trying to figure out how I could convey the real Lotte. The result – I came up with a different Lotte every morning. How can one ever put all the different Lotte’s together and make her credible? …. I am an idiot: I did not thank you for the lovely book…But it was everything in such a hurry…. On the trip I did not read the poems, I am not concentrated enough. And I wait for a quiet hour to start them. I am not fond of music. I paint – oil and watercolor, landscape and portraits – and I learn feverishly better and better painting. A terribly great joy gave me teaching which I started last season. Not vocal teaching – God how that would bore me!!! – but interpretation. Some will come out here to continue their studies with me. Why I tell you all those details about me? : I want you to know me. And to like me as I am. I never was a “virtuous woman”. I was rather bad when I was young. Does that shock you??? So – now you don’t like me perhaps. I first heard Lotte Lehmann sing when I was fourteen. I last spoke with her the week she died thirty-three years later. The second time I heard her was the following year, again with the San Francisco Symphony. I went back for her autograph. Getting William Steinberg’s was easy. There was a long line waiting to see Madame Lehmann. She stood at a podium greeting fans. When my turn came, I blurted out, “Every time I hear you, I like you more.” I remember her withering response exactly: “Oh! You think I’m improving?” I had no idea of her to-that-point thirty-four year career – with seven to go. I just thought her extraordinary. I had the good judgment to be born in California (they talk like that here). I was living in Burlingame and later in San Francisco before returning to Hollywood in 1947 to study theater arts with Maria Ouspenskaya (1876 – 1949), another Madame. During the last year of high school, I began ushering at the San Francisco War Memorial Opera House. That, plus flying to Los Angeles for one performance, was how I heard her last Rosenkavaliers. I went to a Rosenkavalier rehearsal with great expectations, but was terribly disappointed; Lehmann no longer did rehearsals. 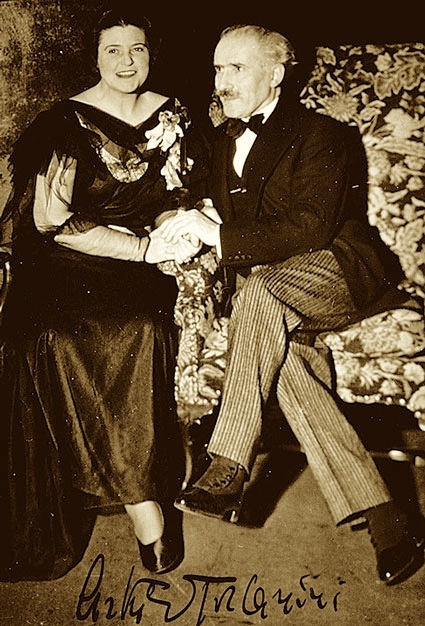 Before the performance, I waited at the stage door to get her signature in Opera magazine –an article about the 1945 season featured pictures of the principal singers. She walked up alone. I didn’t recognize her at first – a slightly dumpy, middle-aged woman, walking slowly, snug in a fur coat. Not the glamorous persona she could invoke on demand. Many of the singers I’d approached asked my name and signed “To Herman.” Because she was special, I wanted to make sure and asked, “Would you write ‘to Herman’?” Without hesitating, she took the magazine, said, “No!” and signed. This was before a performance and I should have realized she must have been stressed and tense and didn’t welcome this attention. In the spring, as part of the Beverly Hills Music Festival, Franz Waxman conducted a program which included excepts from Act I, Rosenkavalier. In December at UCLA another recital, in which she sang the Brahms Zigeunerlieder – wild and wonderful. I bought the album immediately – and have not yet heard a performance or recording that approaches hers. She did that with lots of music. Later I told her how very much I liked those particular songs. She seemed surprised: “You do?” Apparently she didn’t. But you wouldn’t have known it listening. Alexander Koirensky came to visit his old friend Mme Ouspenskaya. He had been an assistant to Stanislavsky at the Moscow Art Theatre and was a translator of Chekhov. I told him I was going to a Lehmann recital. First he said how lucky I was. Then he paused in a way many Russians pause as they remember the past, and added, “When she sang Doppelgänger you didn’t just hear it – you felt it here,” indicating his gut. I heard her a few more times before being drafted into the army in January – the next month she sang her Town Hall Farewell. After the army I moved to Michigan and college – medical school – marriage – psychiatric residency – children – established a practice – settled down. I immediately wrote back recounting memories of recitals, especially her performance of Morgen, at the first recital, and of painters I admired. They arrived – we eliminated one – but choosing between the Zinnias and the second “Morgen” was not easy. I asked if we could keep the two for a couple of weeks before deciding. She was to be in New York for a Master Class at Town Hall in April. I wrote we’d be there. After being introduced by John Brownlee (1900 – 1969), she came on stage and the audience went wild. When she was able to get us to stop applauding she said, “Like Hans Sachs says in Meistersinger, ‘This is easy for you, but it is hard for me.’” Afterwards it seemed the entire audience went back as they had at her farewell in that auditorium fourteen years before. At the doorway of the Artists Room she sat protected behind a table. We introduced ourselves – she smiled, nodded, and we were pushed on and out. When we got to the street, I realized, “She didn’t know who we were.” It was the only time I saw her totally overwhelmed by an occasion. Disappointed, I called the next morning. She invited us to her room where we spent a half-hour or so. To my surprise, she had flown to New York alone. Because of their menagerie, she and Frances were no longer able to be away at the same time. 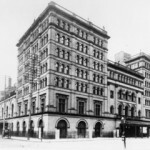 Lehmann said she was returning to New York next April as a guest at the closing of the old Met. “Will you be traveling alone again?” “Oh, yes.” This wasn’t my image of how great artists traveled. I said something about my concern (she didn’t seem to have any) about the dangers of travel and New York City and that we had better come to California and fly with her. She thought that would be fine. We arrived at her home, rang the bell, she opened the door. She introduced us to Dr Holden and then took us on a brisk walking-tour. First through the house. She and Frances each had their own large living rooms: music room and library. In this way Lehmann could isolate herself from Frances’s’ friends whom she found “too dilettantish.” There were many watercolors and felt appliqués on the walls – including the two song cycles – without any consideration given for their conservation. Many of the watercolors were faded, the exposed cloth pieces faded and moth eaten. As we passed through a hallway to the garden, in a protected spot, I recognized a pristine watercolor of Detroit: a snowy day with the Fox Theater marquee in the background. Painted before a Detroit concert. Passing it, Lehmann said in an aside, “You can’t have that one.” I hadn’t asked. She knew before I did that I would want it. We followed her to the garden, the walk-in birdcage, and two kilns. Frances had to get the second; Lehmann couldn’t stand the time it took for ceramic pieces to fire and cool. In the garden was an uncanny life-like statue of Lehmann singing. It stood just off the path to the home’s most often used entrance, the good friend’s entrance. You’d catch a glimpse of it in your peripheral vision and feel for an instant there was someone there and then that she was standing there. Frances intended that this remarkable piece go to the University of California’s Lehmann Archive where I felt few would see it. Although none of my business, I suggested that the Music Academy seemed a more appropriate repository. Especially since so many current vocal students stood as though nailed to the spot with arms lifeless at their sides. Lehmann’s approach and practice was that singing goes from “the top of one’s head to the tips of one’s toes.” And to sing “with a forte of emotion” – which doesn’t mean loud. Back to the first tour of Orplid. In the studio where she did some of her artwork – glass mosaics, ceramics, tiles, and sculpture, she pointed to a box of works etched with a stylus on a special black board. She said pick one! I picked a very sweet angel who appeared to be giving a vulgar hand gesture. Lehmann found hands to be the most difficult part of drawing. I have a Madonna and Child in which the Madonna has two right hands. Later two friends arrived. Frances served hors d’oeuvres and drinks. Lehmann mentioned that she was quite tired and wasn’t at all looking forward to the trip. Now being more aware of her history, I asked why then was she bothering to go, as the Met hadn’t been that major in her career. I thought the other people would kill me. She didn’t disagree, but said she had promised. In February, Lehmann had written: “I prefer the seats in the first class, and if you could arrange that I sit at the aisle opposite you both we are very able to talk!” The airlines put me across the aisle from them. Miriam insisted that I sit next to Lehmann – window seat – she and Lehmann sat across the aisle from each other. At Kennedy Airport, John Coveney had a limousine waiting. The next evening we were included in a gathering of old friends: Constance Hope (1908 – 1977), Marcia Davenport (1903 – 1996), and John Coveney. We saw Lehmann in the elevator a few times. We didn’t have tickets for the Met “farewell” and we didn’t travel back to California with Lehmann. Except for the exchange of letters, that was it for a while. Master Classes at Northwestern the first two weeks in May. I attended five of the six. A colleague who thought me obsessed joined us for one. Afterwards I wanted to introduce him – but he was too awed to go back. The first class was devoted to the Schöne Müllerin cycle. In her introductory remarks she discussed the mental state of the love-stricken miller. She suggested he probably could have benefited from psychiatric attention and gave me a look. Before classes, she wrote out the English translations for the songs and took them with her. If she looked at them, I was never aware of it. She explained each song before the student began. Sometimes the student’s conception was totally at odds with hers – and that could be all right. “What you do is completely wrong! But I like it!” She never was critical of a student’s voice. If they didn’t tune in to what she was doing, she would dismiss them with a quiet and polite, “Very good, very good.” If she was hard on a student – it was a good sign – there was something there. At one point in Europe she introduced me to a woman saying, “She had once been a student of mine and has a very pretty voice.” Which was code for why I had never heard her name until just then. We had dinner together at the Orrington Hotel before the last two classes. Our waitress said, “Madame Lehmann, I would love to hear you sing.” LL: “Oh, I don’t do that anymore.” She: “I heard you were good.” LL: “Oh, I was good.” Without telling me, during the class that evening, she sang Brahms’ Mainacht, in a whispery baritone. She had promised someone she would and being a good person was keeping her promise. The Chicago classical radio station recorded the series; copies are in the UCSB Archive. Her only stereo recording. It is raining and cold – and I would like to know why I wrack my brain about your baby’s name. The sun didn’t do that to me, one can be sure of that! …. 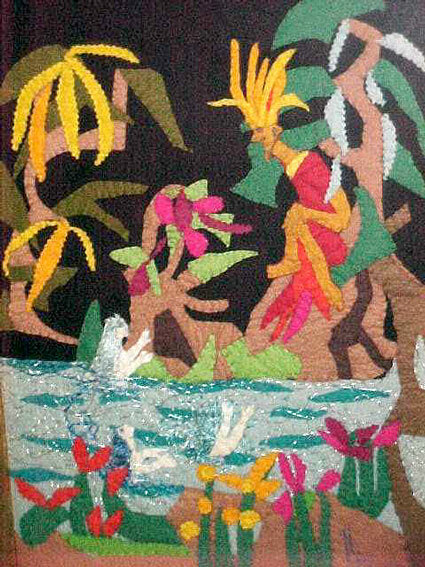 With this and the sale of slightly smaller piece she said her next trip to Austria was paid for – so why didn’t we join her! Traveling together is the acid test of friendship. How tempting, though. While I agonized about the trip, Lehmann agonized about the purchase. Even after the picture transaction was completed, it wasn’t. I have to explain all this unwelcome bickering about money. You see it is for me simply dreadful to SELL something to a FRIEND. When you bought that watercolor [oil] I did not know you at all and it was something exciting to me to sell a picture without any recommendation of somebody else. But now the situation is very changed. I would have loved just to GIVE you the big picture, but it was so much work involved that I had said from the beginning: ‘I only give this away if I get my price.’ Then YOU wanted it and I had such a bad conscience. It really is all absolutely the contrary of what you thought: I am far from being a business-woman. O God! So please forget the whole incident. I have suffered enough about it and you gave me sleepless nights, curse you. The best would be if you would come to Bad Gastein which I leave on the 9th of July. …. I hope you have a lovely Christmas – it should be so with these even for me enchanting children. Dear Herman – Why in heaven’s name could Miriam not come with you? It would be lovely to have her to share in all the fun…. It’s so nice to make plans… Much love to you both. Shortly after the birthday celebration I received a letter from one of her fans: “You know, our Lotte is really 85.” When I told her this she was furious. She admitted that early in her career she had wanted to fudge about her age. Going through customs, she had asked the inspector who was checking her passport, if he could alter the birth date – while explaining that would be impossible, he tipped the inkwell onto the offending page. I really think Miriam should come along. I think Miriam would enjoy these trips just as much as you will. And I must say I feel rather embarrassed to burden you with a woman of 80 – you look much too enterprising for that!!!!”.. Miriam would not relent, so I flew off alone to Munich, where I rented a car, re-visited Garmisch where I had been stationed, then on to Bad Gastein and Der Kaiserhof. In all her travels Lehmann said she never had done her own packing. There was always someone. 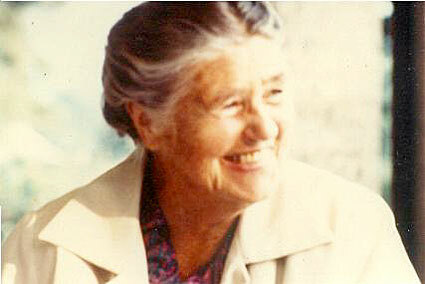 This time that someone who accompanied her and did the packing was Rose Palmai-Tenser (1902 – 1971). Born in Prague and a former student, in 1946 she founded the opera in Mobile, Alabama. She was fiercely devoted to Lehmann until the day she died. I was quickly exposed as a “viel fresser.” To accommodate me, of course, we drove to Vaduz, the capital city of Liechtenstein for lunch – saddle of venison. The food at the Kaiserhof was worthy of a Michelin star. One of the highlights of the day was the posting of tomorrow’s menu in the elevator. Although I was never late, Lehmann was always sitting in the lobby waiting for me: “I will be early even for my own funeral.” The place was, probably still is, like a 19th century castle. Totally elegant – Frances couldn’t stand it. Lehmann would take the thermal baths right in the hotel. A local doctor had to prescribe the treatment. Lehmann was amused by her doctor who annually insisted, but never convincingly, that she had gall bladder disease. Walking to town, we passed Gallerie Welz which had a Kasimir etching of Bad Gastein in the window. Lehmann suggested I get it – I bought it and another each time I returned. Besides the food, the days were filled by visits with old friends and students, interviews, side trips, and letter writing. We would sit on her balcony, have tea and enjoy the too-picturesque-to-be-believed scenery – with echoing cowbells. After Bad Gastein, Lehmann, Rose and I went to the Vier Jahreszeiten in Munich. We freshened up, unpacked, and met for lunch in their Café Walterspiel. It was late with only a couple of other tables of diners. There were at least three waiters attending us. I had the impression you could hurl a knife to the floor and someone would catch it before it hit. One waiter whispered in my ear to go and get a jacket. I motioned to an unjacketed man sitting nearby: “Yes, but he’s a child!” So up I got. Lehmann asked that while I was upstairs would I get her glasses. 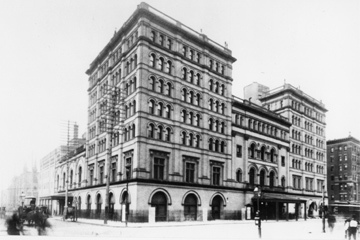 When I returned, acceptably garbed for the help, Lehmann said, “Don’t kill me, but I need my scarf – the air conditioning here is quite intense. It’s in my large suitcase.” Back up – but I couldn’t find the scarf. When I returned she was wearing it! “Herman, I’m terribly sorry. I found it in my purse.” I said, “It is really wonderful that you’ve reached 80, but you’re reducing your chances of reaching 81!” She enjoyed retelling this threat. Miriam did come. Lehmann sent Tinta, her usual driver, to pick us up in Salzburg. The train was late. When we arrived, Lehmann, Rose and another guest from the past, were at the dinner table waiting for us. After greetings and introductions, Lehmann leaned across my wife and asked me, “Herman, for some reason homosexuals find me interesting. Do you find me interesting?” I said, “No, not at all.” Frances said that when she first met Lehmann she would arrange dinner parties of people who were incompatible to see what would happen – I wonder if this was a remnant of that behavior. Lehmann thought that some time spent in Schruns would be beneficial for Miriam, who had TB the winter before. So from Gastein we drove to Schruns and the Kurhotel Montafon. One morning, I went for a walk and met Lehmann sitting on a bench. Without breaking the silence, I sat next to her. After a few minutes she said, “When I signed the marriage contract with Otto, it was over.” I said nothing. She went on to say the only person she really ever loved was her mother. She asked how I was going to feel when she died. What she would miss most was the next sunrise. Lehmann was honored at a reception celebrating the publication of the Wessling biography and was presented with the Silver Mozart Medal from the Salzburg Festival. One day, she noticed former Austrian Chancellor Kurt Schuschnigg (1897 – 1977) in the dining room. After he left, she thought it was strange he hadn’t come over to say hello. He used to adjourn cabinet meetings when she sang Fidelio – he’d come to the opera house, listen to the act II aria, and then reconvene the cabinet. Coming to breakfast in minimum-risk shorts, I and was greeted with a softly sung, “Ein nackte Mann, Ihn muss ich fragen!” Lehmann asked how old I was: “Half your age.” With those blue eyes twinkling, she said, “If we had met years ago, we definitely would have had an affair.” I gulped, “I know.” Some time later she described her last romantic encounter. She was in her late 60’s. 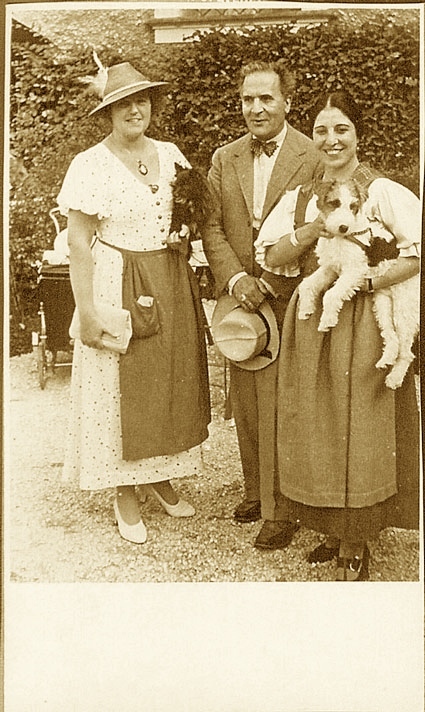 This year the itinerary was Bad Gastein and London for the publication of her last book, “Eighteen Song Cycles,” Lehmann, Rose, Miriam and me. While we were sitting out on the balcony, the phone rang in the room. I answered. It was Lillian Gish (1893 – 1993): “May I please speak to Lotte?” After their conversation, Lehmann said, “That was very strange – Gish said she had been thinking about me all the way over from the United States and was so happy to read in the paper that I am in Gastein.” Two days later was set for the visit. The next day flowers arrived from Gish. The morning of the visit, Lehmann had figured it out – “I feel so guilty – those flowers were not intended for me. She thinks I’m Lenya!” Our middle child, Karl, had the same confusion. The desk called. “Miss Gish is here.” I opened the door, she asked, “Where is Miss Lenya?” I said, with a sweeping gesture, “On the balcony.” Gish took one look and did a worthy double-take. Lehmann immediately said, “I know what happened.” They spent the afternoon chatting while I took pictures of the two new friends. They corresponded until Lehmann died. 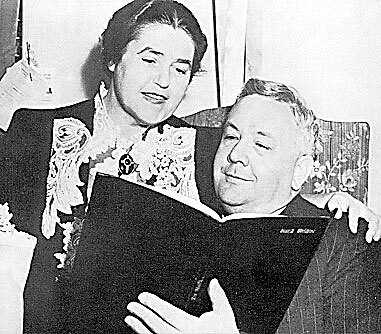 Gish later wrote an article for Opera News in which she stated how wonderful it was to have studied with Lehmann when she was young! A lesson on the reliability of source material. 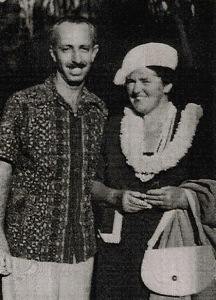 At Heathrow, the custom’s officer looked at Lehmann’s passport and said, “There was once a singer with the name of Lotte Lehmann,” returned it to her and held her hand for a moment. I started pushing the cart with Lehmann’s luggage. Rose snatched it away. That was her territory. We stayed at the Hyde Park Hotel. The manager, Jonathan Dale Roberts, had a silver rose made as a welcoming gift. The morning after Rose, Miriam and I had gone to Glyndebourne to see “Ariadne auf Naxos,” Lehmann called our room – “Could you come up? Rose and I just had breakfast. Rose said she had a headache and went back to bed. Now she won’t talk to me.” I never dressed faster. Lehmann was pacing in the sitting room they shared, Rose was comatose and breathing her last labored breaths. I got Lehmann to sit down – called Miriam who asked how things were. “Grave. Come up.” Standing in the doorway between the bedroom and the sitting room, I saw Rose take her last breath. I called Mr Roberts for an ambulance, and to have them enter through Rose’s door. Lehmann said she would have to go to the hospital – I said, “No.” “But Rose will be angry when she wakes up and I’m not there.” “Please get Rose’s husband’s phone number for me to call when I get back.” I took Rose’s passport which was next to the bed with half a chocolate bar – she was 10 years older than she had told her teacher and diabetic. I followed the ambulance in a cab. Returning to the hotel, I was greeted by Mr Roberts. I agonized about what to do – I had no idea about Lehmann’s cardiac status, there was a reception for her new book, a Lotte Meitner-Graf photo session, on and on. Mr Roberts gave me the best possible advice: “Remember, whatever you do, it will be wrong.” I went upstairs. “How is Rose? Is she better?” I shook my head, “No, worse.” “How could she be?” Lehmann realized she had died and wept. I called Rose’s family in Alabama; her daughter arrived the next day. When I came back to the sitting room, Lehmann said, “So, let’s order lunch.” Exactly what Rose would have wanted. This rapid recovery haunted Lehmann. In London, she carried on with all the planned events…the photos were the last professional ones taken and are fabulous. When she returned home she refused visitors. Frances asked me to come out from Michigan. She met me at the airport – and snatched my luggage out of my hands. [These women!] She told me what to expect. At dinner Lehmann asked me how to commit suicide. What pills would she have to take? I said suicide by ingestion was unreliable – and aspiration pneumonia was likely and very painful. The only sure way was with a gun in your mouth. Frances interjected, “And I’m not going to clean it up.” This was helpful – the depression lifted as evidenced by future planning. Plus there was the stimulation of an exciting new student: Jeannine Altmeyer – “She’s a young me.” The student had a sponsor who became the replacement traveling duenna: Laura Lee Hammergren – but not without a rocky beginning. The latest mania – the “white roses and champagne” one whom Lotte had refused to meet is coming next Sunday. We shall see what we shall see. Boredom got the better of Lotte’s judgment. Of course that happens frequently and I have to cope with the results. This time I suspect I should have a straight jacket on hand. However it looks as though I might land in a psychiatric ward before either Lotte or her adorers do. Incidentally, we have acquired another dog – aged 16 and all that goes with that canine age. Lotte insisted she was to sleep with her, but two nights of it has convinced her that the animal should sleep with me. Actually that will involve much less getting up at night for me, so I am all for it. Would that you were nearer. You are the best medicine for the diva. I am terribly sorry that Mme Lehmann was so rough with you. I knew what would happen if she asked you here and begged her not to as it has happened so often before and is heart rending to those who expect something different. After all she did warn you! The reason she asked you was that you had been so kind to Jeannine that she felt it was very impolite not to invite you here. She never intended to do it again. That is her way. As an artist no one can exude more warmth, but as a person that quality just doesn’t exist. She loves to be adored from a distance but any sentiment nearby is just not to be tolerated. I won’t try to explain this, but just realize that she is a phenomenon and not a human being. There is nothing one can say about her of which the opposite isn’t equally true. She has no medium degree of anything, only extremes. As to help – the only person who can help her is herself. I am delighted to report that for the last few days she has seemed to begin to realize that and is really very much better. About 60% of her trouble is psychogenic, but her knees and hip are very deformed. As she has never had a pain in her life, she just can’t bear to think that she will have it now and tries to keep from moving when it hurts – which of course is the worst thing for arthritis. She has been walking more the last few days and it is beginning to make walking easier. Don’t worry about her. Just enjoy her art through her records etc. She will carry on in whatever way she wants to no matter how the rest of us stew. In September 1973 Miriam and I began to legally terminate our marriage. Lehmann was very upset – for the children. In late 1973 Lehmann wrote that she was going to the Salzburg Easter Festival to hear “Tristan & Isolde” – von Karajan had a new Isolde who was supposed to be “quite good.” She suggested I go. I saw that Jon Vickers was the Tristan and wrote that this should be a terrific experience. She wrote “You like his voice?” but allowed that it was impossible to discuss these things in a correspondence. This year her letters were dictated. There is none of the “shaky, small and scraggy ” writing Jefferson reports reflected in her signature. I feel very much better. Perhaps I was out of my mind when I felt so badly. Gastein now seems a possibility again. In July I planned a trip to California with my son, Karl, with our itinerary enhanced by Lehmann – Karl would enjoy San Simeon. She offered to help Karl distinguish between herself and Lenya. When I spoke with her on the phone to finalize plans, she initially had difficulty recognizing my voice – then a letter came. Lotte just received your letter. She says that I must write you immediately to tell you that she cannot see you in the morning but that you would be welcome in the afternoon of September 3rd. She is rather miserable and all the medications she is taking seem to make her more so. It is very difficult for her to concentrate on anything and she is getting hard of hearing and tires very rapidly. Do not expect the old Lotte. She is getting to be a very old Lotte. If you can cheer her up for a few minutes I shall be very grateful. When I got home on the 26th there were messages on my answering machine from friends who had heard her death announced on the radio and TV. I called Frances. Maurice Abravanel (1903 – 1993) had visited the night before – overstayed – and left Lehmann weeping about people not knowing when to leave. Frances said that Karl and I were to come ahead as planned! I didn’t see Frances again for 13 years. Oh! You think I’m improving? It could have been this delusional thread that was picked up by Jefferson and soured Frances. “I Hate Music, But Like to Sing” – Leonard Bernstein song – premiered by Jenny Tourel (1900 – 1973) in 1943. Frances blamed Lehmann for the criticism she received for a flawed vocal technique. Lehmann publicly complained about her lack of technical perfection. Frances said she was in fact fanatical about technique and would return to her teacher, Felicia Kaszowska, whenever she thought she needed to. 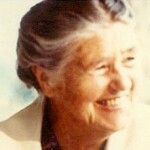 Kaszowska is mentioned her in her autobiography. Many reviewers marveled at her technique. “Jocko gets every morning fresh water for his cup and for his bath. The cup with the seeds has not to be refilled too often, he does not eat so very much of it. Every morning I take one zwieback and one ritz cracker, soak them in water for a moment, crush them so that no hard piece remains. Then I put half of an egg yolk with it. This is the filling for one cup. Every morning I throw away the remains of the fruit. Jocko gets tiny bits of banana, apple, some raisins. Then I peel grapes for him, cut them in half and also quite a lot of little pieces of alligator pear. That he loves especially. But please don’t ever give him pieces which are not fresh. They get very easily brown spots – I never give him such a piece. In the afternoon I generally give him fresh fruit, but only a little. He loves also crushed nuts very much. I hose each morning his cage clean and brush with a sharp brush his food place. The words he says are: How are you my Jocko? He says: Sorry, it is time to go. I am tired. I feel lousy. After Frances died it became mine along with a Luigi Kasimir (1881 – 1962) etching of the Vienna Opera. Suzy, a male parrot, had been named after a look-alike friend before his gender was known. I was there 29 years later when Suzy died. Suzy, who had no vocabulary other than screeches, participated in every conversation and accompanied music. I was up earlier than Francis, then 96. The sun room was silent. I found Suzy claws up in his/her cage. To announce the news, I momentarily blocked Frances from entering the room. “Well, that’s one less living thing to take care of around here,” she said and pushed ahead. Years later Karl followed this imperative, but deleted the wrong syllable! At the time she wrote the book she’d forgotten that Eric Kleiber was the conductor. Beecham was in the audience. 1976??? In which my right ear can be seen behind Maurice Abravanel in photo 37 taken at the 80th birthday party. I said how proud she must be of her student, Marilyn Horne. Lehmann disavowed any credit: “Jackie had it all when she came to me.” At 17! So reading in Horne’s autobiography about the drubbing Lehmann gave her – seemed to me, and Frances confirmed this, was intended to galvanize her into leaning to sing German as she had learned to sing English. 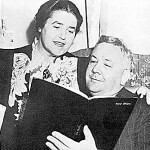 Of Lehmann’s December 9, 1946 recital, Marjory Fisher wrote in the San Francisco News: “She sang two English songs – Clifton’s ‘If Music Be the Food of Love,’ and Haydn’s ‘She Never Told Her Love.’ But she sang those texts as impeccably as she sang her native German….her French songs were no less remarkable from the standpoint of diction…” She never had expectations for others which she had not placed on herself. I better send you also a recommendation in English. If you cannot use it on your trip, you may perhaps like to use it another time. I think it is a wonderful idea that you go to Germany, and I hope it will be the beginning of the career for which your beautiful voice and your talent certainly has destined you. You have only one very severe handicap! You are too shy. Dear Brunetta, you have to overcome this. To become a real artist and make a career, one has to have more than the God-given voice and the talent. One has to have the personality. You have this personality when you sing and act, but in the moment when you are Brunetta, it is lost. I don’t want to depress you with this statement. On the contrary, I want to help you, and I trust that you know how well I mean it. If you keep in mind that from the beginning you enter a room full of people who know who you are and expect to meet an accomplished artist, you play a role. Forget that you are Brunetta Mazzolini. You are the singer, and you have to act as a singer. You cannot hide in a corner as if you would like to disappear. On the contrary, try to be arrogant. It may sound to you strange that I say this, because I hate arrogance, but I know that you are so far from any possibility of being arrogant that if you may think you are, you may just do the right thing… Unfortunately the world judges very often superficialities. I personally like your shyness. I think it is very sweet, but it is not sweet for a singer who wants to make her way. Think all this over, dear Brunetta, and try to do what I tell you to do. My love and my warmest wishes go with you.